Summary of the trail results, published at ACC 2012. Includes an assessment of the conclusions. New clinical data for left atrial appendage occlusion therapy, presented & published in 2016. Includes a critical review of the Stroke Prevention section in the 2016 ESC Atrial Fibrillation guidelines. 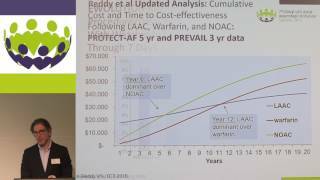 Why might LAA occlusion therapy be cost effective, despite a high procedural cost? This presentation is an overview of the health economics data available for left atrial appendage closure therapy. 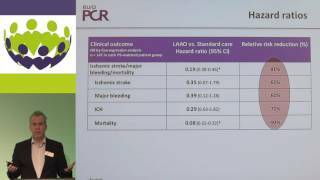 John Camm, Hans Christop Diener - Debate: Are the new ESC guidelines too strict for LAA Occlusion? John Camm, UK vs Hans Christoph Diener, DEU Debate: Are the new ESC guidelines are too strict for Left Atrial Appendage Occlusion? John Camm - Yes, they are too strict. 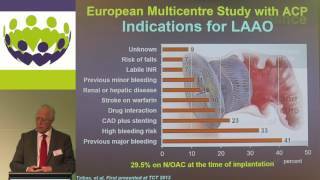 There is a larger group that should benefit from LAA occlusion and it should be stronger recommended too!Hans Christoph Diener - No, the ESC guidelines are right; LAA occlusion Should be limited to OAC contraindicated patients!